Here is a very happy post! One that I hope will inspire you to make these gorgeous Happy Birthday Cupcakes. They look like a celebration at just one glance! They also can be made for anyone, young or old would love you for them. Vanilla cupcakes are my daughter’s favorite. Amber was the one to make these gorgeous cupcakes for my birthday and to share with you all here! I just adore the color of icing she selected. It is a gorgeous blue and I know you all want to dive right into them. The cupcakes themselves are moist and delicious with a little added sour cream. The buttercream frosting is perfection. If you want to mound it up high like you see here, you can double the recipe easily. Otherwise there is enough icing for a generous but more conservative amount for each. Not only do I love sprinkles on the outside but all the way through!! We used jimmies for the interior, they are the longer sprinkles you see around. 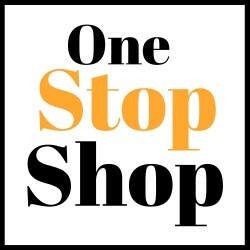 Your local craft store should be able to provide you with a great selection but there are also more online. These cupcakes are a take off of our very popular Vanilla Candy Cane Cupcakes that so many of you have loved for the holidays!! With a few tweaks Amber has transformed them into gorgeous birthday cupcakes. These would also be so pretty for other occasions too like a bridal or baby shower, anniversary, Easter and more! Happy Birthday Cupcakes Recipe Type : Dessert Cuisine: American Author: Tara Noland Prep time: 40 mins Cook time: 20 mins Total time: 1 hour Serves: 18-24 cupcakes Happy Birthday Cupcakes will surely put a big smile on anyone's face when they receive these moist vanilla cupcakes topped with buttercream frosting. Preheat oven to 350F. Line 18-24 muffin pans with cupcake liners. Cream butter and sugar together until fluffly. Add the eggs one at a time and then beat in vanilla, sour cream and milk. Mix well. In another bowl whisk the flour, baking powder, soda and salt together. Slowly add the flour into the butter mixture and mix until just incorporated. Fold in the sprinkes. Spoon into cupcake liners ⅔ to ¾ full. Bake for 18-20 min. until they bounce back to a light touch and are lightly golden. Let cool on wire racks completely. For the icing, cream the butter in a large bowl. Carefully incorporate the icing sugar and the cream and continue to beat until light and fluffy. Add more cream if necessary. Color to the desired blue colour and mix well. Place icing in a piping bag with a tip and decorate as desired. I usually use a star tip 21. You don’t have to be fancy. Sprinkle with additional jimmies or sprinkles. Place cupcakes in a covered container until you are ready to eat. Refrigerate, remove from fridge 30 min. before serving. Enjoy!! Tip: To mound the icing up high like you see, you will want to double the icing. Otherwise they will have a more conservative amount for each. the first word of the title says it all: HAPPY. From birthday to beyond, these cupcakes are bound to make people smile! Perfectly classic. It was Club House liquid blue food colouring which I believe is a Canadian only brand but she just kept adding until she reached the colour she wanted. These look wonderful. 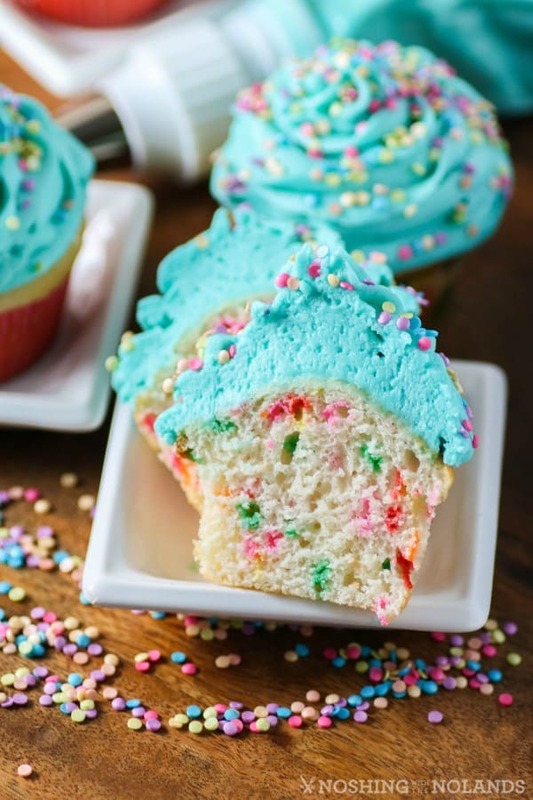 I love the blue color, and who doesn’t adore sprinkles? Those are super cute. I can never get my frosting to be piped that pretty. These cupcakes look so delicious. My boys would go crazy because they love confetti cupcakes. I would seriously make these any time. 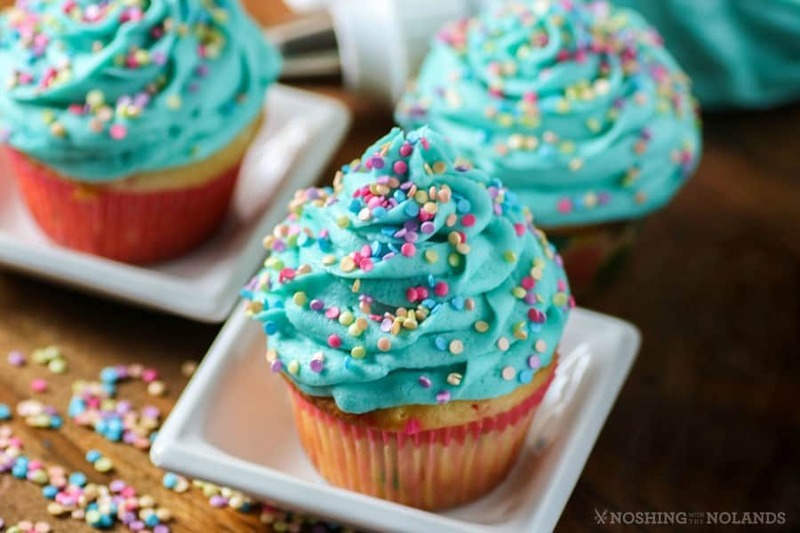 I love these style of cupcakes and that icing looks awesome. These cupcakes will be perfect for my Sisters Birthday. I am in charge of the cake. I am going to give this recipe a trial run this weekend. Mmm, delicious and cute! I think sprinkles on the inside were a good move. These cupcakes sound great. These look so pretty! My sister-in-law made some similar to this a while back. They were pretty and good, just not as good as these. 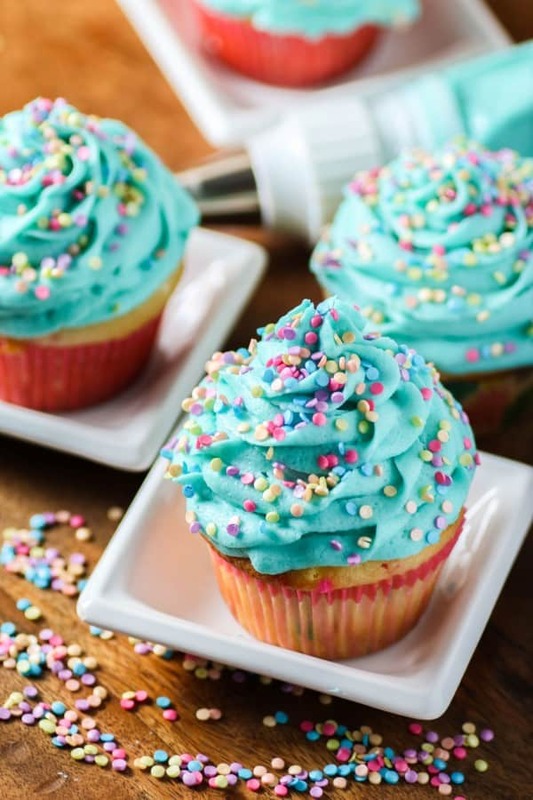 My granddaughter would love these cupcakes because they would remind her a bit of Elsa. Sprinkles are very popular in our household so they would be appreciated in/on their cupcakes. I also think the color of your frosting is a “happy” color. Your images are awesome also, they make me want to reach into my screen and take one. These cupcakes would be the life of any party with my grandchildren and my great nieces. The colors themselves say “party” and a bit of spring. Also everyone loves sprinkles! So they would be a hit all the way around. Oh my goodness! How adorable are these!? I totally want to make these for my daughters birthday, she’d love them. How fun?!! 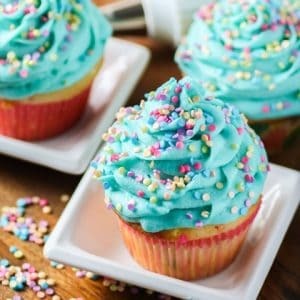 I love the colors of these cupcakes! I wish I can have these for my birthday!! These sound so yummy and they’re so pretty too! I think they’d be a great way to celebrate the birthday of someone special. Is icing sugar powdered sugar??? Yes, also known as confectioner’s sugar. I will add that, thank you. It is 10% cream, half milk and half cream is why is is called that. Hi can I save the mixture in the refrigerator for a day or two before baking. From googling I would say no, I have never tried though. I don’t think they will rise the same. Do you recommend baking and eating in the same day? I have a little boy turning 2 tomorrow and party is on Sunday! Trying to decide when I should attempt to pull these off. Lol. Thanks. You could do them the day before and keep them nice and sealed and they will be great! Hi, I’m a huge fan of this recipe, I use it all the time. I have to make a chocolate cake this time, is there anyway I can incorporate Cocoa powder in this recipe? I would say yes, I would add 1/4 to 1/2 cup of cocoa and add a couple more tablespoons of sugar to sweeten it up.You could add in another dollop or two of sour cream so it is not dry. Good luck! That is so awesome to hear! Thank you very much for taking the time to tell me!! Happy Baking! !